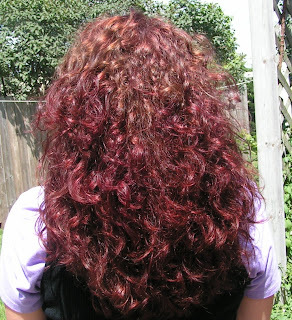 That's me- the back of my head with my new purple hair. The sunlight makes it a bit lighter but you can still see it. I like my hair. I spent years fighting it - always crying becuse it's not straight and I couldn't style it like everyone else did. When I was poor and married I just let it grow - and when I was expecting the kids it was to my waist. I had more hair than I ever imagined. People used to look at me - I told myself all the time it's the hair and not the crappy old car or the look of despiration I always wore. Pride in my hair kind of stuck. I got alot of grays while I was married so I have to color it alot and that's where the purple comes in - my roots started to show and I wanted something a bit more fun than brown. I don't care if people look at me now - I still tell myself it's the hair and not the chatty grubby kids I always seem to have around me. Of course, Khloe is getting looked at, too. Those of you who know hew know that she's very beautiful with gorgeous eyes. I tell her that's why people look but she thinks people are making fun of her. I'll keep trying to convince her otherwise and someday maybe she'll believe me. Yesterday the kids and I went to see the new Harry Potter movie.Kerry and I have read the book and had told Khloe about alot of it. She's not as much of a HP fan as I would like but she came with us - of course, I agreed to take her to see Ice Age 3 as a bribe. About halfway through the movie she got interested and asked questions. I told her that apparating is like how Doctor Who travels in the Tardis - disappears and reappears. Then, of course, she asked if the vanishing cabinets were bigger on the inside. I hugged her with pride and told her no, they're just boxes. And then the end came - and she cried and cried - all the way home. People outside the theater gave us sympathetic looks. I tried to explain it all to her - why Snape did it and that Dumbledore was sick but she was too upset. We'll talk about it again and I'll help her understand why her favorite person died. Jenny had it tougher - her daughter is a huge Snape fan and was very upset about it from the other side - why would her favorite person do that? Ah, kids. At least my baby girl is on the path of sci-fi geekdom already. Momma's so proud! In my quest to find the perfect perfume oil I have found a Fragrance Goddess. Her etsy shop is Velvet Moon Bathery - I'll link her, don't worry. I got several samples from her and they're magnificent - even the ones I don't like as much are still really good. Her scents are smooth and warm and last for hours - they're not loud or too strong and don't clear the room like some I've tried. I will share my samples with anyone who asks - yes, mom, I'll give you a couple, don't worry. If you order from her you can tell her I sent you - I won't get a discount but I'd like for her to know that I'm talking about her. My boy will be starting middle school this fall. He's getting so big. I have the mom thing of thinking about him as a baby still, taking his first steps and running around the house with a big bouncy ball wanting to play with the big boys walking down the street. We got the letter about fifth grade orientation and registration and when he can try out his locker combination and check out the school. I'm so nervous and excited for him. Are all moms like this? Does the excitement ever wear off? I hope not - it's keeping me from sinking into a middle aged rut of boredom. I've been rewatching Battlestar Galactica. Have you seen it? It's really a great show. I was invited to join a kal group on ravelry and it's been fun discussing the characters with other fans. I was selected to be in the Galactica crew. My ship colors are blue and gray - same as Ravenclaw! I need some dark blue cotton for some dishcloths - the assignment is to make dishcloths with the logo on them. I plan to make them as a gift for someone - another sci-fi geek who I admire. I also joined the Team Galactica for Tour de Fleece even though it's almost over. I think that's about it. I need to turn in some assignments for the House Cup and get busy on my OWL. Until later, my friends! OMG I love your hair! It's so YOU! Congrats on getting KhloeBelle interested in the movie. I want to see it again. That hair is frakkin' awesome!